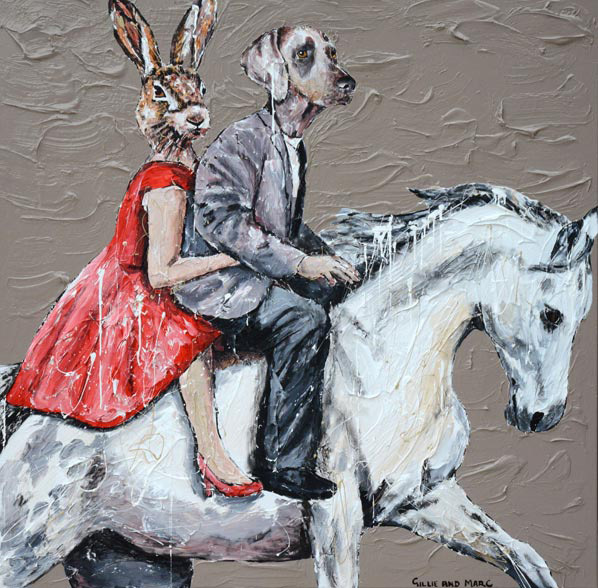 Gillie and Marc hand signed fine art prints available from Etching House, Etching House has a full range of Gillie and Marc limited edition fine art prints, paintings and sculpture works available. Fine art print sizes are, 594 x 420mm, 841 x 594mm, 420 x 420mm, 500 x 500mm, 594 x 594mm. 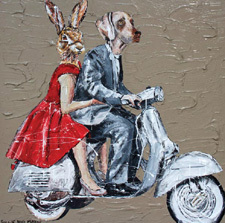 As husband and wife, Gillie and Marc are Australian contemporary artists who collaborate to create art as one, applying the iconic imagery of the dog/human hybrid to celebrate the powerful spiritual relationship that exists between man and animal. Gillie and Marc reference their own remarkable love story in their works, perpetuating a pursuit of happiness and encouraging us to challenge the status quo and the perceived safety of societal convention. Gillie and Marc’s unparalleled love is the cornerstone of what they are and of what they create. Meeting in Hong Kong, she was a nurse from England and he, a boy from the ‘burbs’ of Melbourne. Wanting only to find a soul-mate with which to share their passions for art, travel and adventure, seven days later they were married at the foothills of Mount Everest. 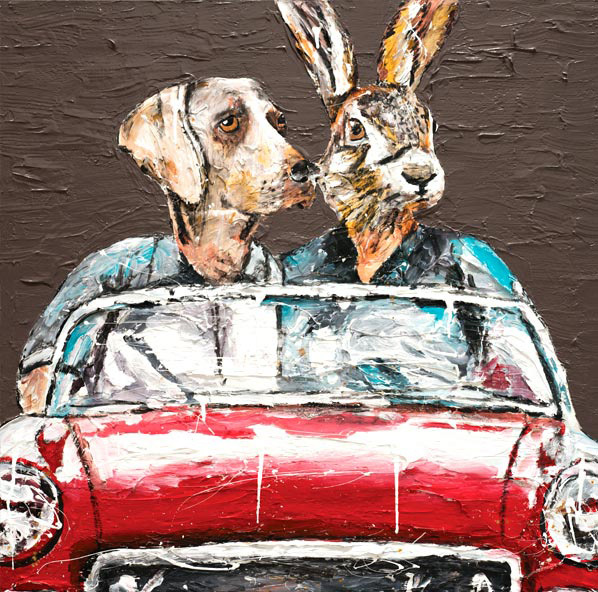 They not only share an unsurpassed dedication to their art but also love for their two children, whom Gillie describes as their ‘best friends’ – along with their mutt, Moby, of course. With a 20 year history of collaboration, Gillie and Marcâ€™s works have received acclaim worldwide and are held in collections both nationally and internationally. Initially, Gillie and Marc painted and designed, but have now become very interested in sculpture – creating commissioned works for: Australia Zoo; Sydney Children’s Hospital; Australian Red Cross Blood Service; Hilton Hotel Singapore; and McDonald’s Corporate Headquarters in Singapore; and recently the Ying Ren Four Seasons Hotel in Beijing. They produce sculptures in a variety of mediums including bronze, brass, steel, wood, fibreglass and polyresin. Awards and accolades are numerous for the Schattnerâ€™s. In 2006 they were Archibald Prize finalists. He’ll never be famous but he doesn’t give a damn, he’s a musician, a painting, earned them first prize at the 2009 Chianciano Biennale, set in Tuscany. This work features a Dalmatian dog/man hybrid, playing guitar. Their life-like fibreglass sculptural piece, Bondi Coffee Dog, appeared in the Florence Biennale in the same year. Stretching controversy further is their work, If Jesus was alive today he would be a skateboarder, which featured in the inaugural 2009 Blake Prize Director’s Cut, an online exhibition. Gillie and Marc will also feature work in the 2012 Sculptures by the Sea at Bondi Beach. District Council of Lower Eyre Peninsula, Cummins SA; Indooroopilly Shopping Centre, QLD; Boulia Shire Council, QLD; Hope Vale Aboriginal Shire Council, QLD; Federation Square, Melbourne, VIC; Hastings District Council, NZ; Emanuel School, Sydney, NSW; St Lucyâ€™s School, Sydney, NSW; Newcrest Mining Limited, NSW; Adelaide Central Plaza, SA; Weddin Shire Council, NSW; Lake Macquarie, NSW; City of Vincent, Beaufort Street, Perth, WA; 101 Collins Street, Melbourne, VIC; Healesville Sanctuary, VIC; Lone Pine Koala Sanctuary, QLD; National Zoo and Aquarium, ACT; Ballarat Wildlife Park, VIC; Dubbo City Council, NSW; Australia Zoo, QLD; Woollahra Council, Sydney, NSW; Ying Ren Hotel, Beijing, China; Maitland Regional Gallery, NSW; McClelland Gallery & Sculpture Park, VIC; Bonorong Wildlife Sanctuary, TAS; Fort Wayne Childrenâ€™s Zoo, Indiana, USA; Sydney Childrenâ€™s Hospital, Sydney, NSW; Bland Shire, NSW; Paroo Shire Council, QLD; Latrobe Council, TAS; Cranbrook School, Sydney, NSW; Gladstone Park Shopping Centre, Melbourne, VIC; Black Dog Institute, Prince of Wales Hospital, Sydney, NSW; Smile Foundation, Sydney, NSW; Darling Park, Sydney, NSW; Royal Adelaide Hospital, Adelaide, SA; Royal Prince Alfred Hospital, Sydney, NSW; CQUniversity Australia; Mosman Preparatory School, Sydney, NSW; The Hilton Group, Singapore; Mcdonaldâ€™s, Singapore; Private collections in Australia, New Zealand, USA, UK, Italy, France, Spain, Hong Kong, Japan, Indonesia and Singapore. 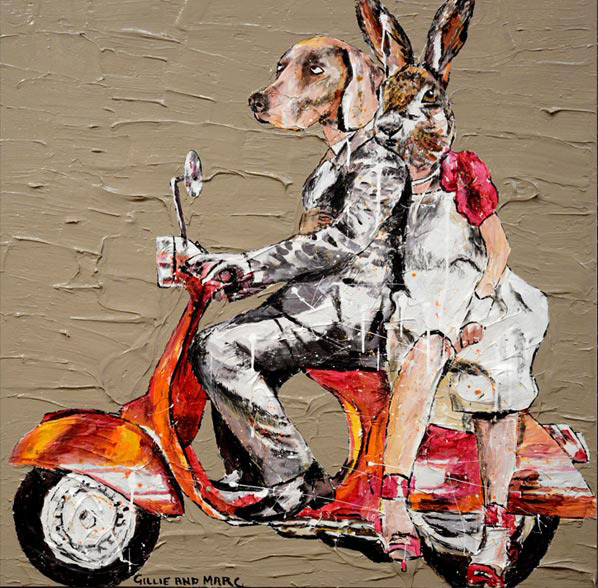 Books by Gillie and Marc at Etching House, New book released titled GILLIE AND MARC – 20 years of marriage and art – A coffee table book – $79.95 – plus reviews and media. Gillie and Marc have been creating public sculptures for many years. They are committed to the idea that artworks should be enjoyed by the community at large. Taking sculpture out of the galleries and museums and into the public realm is an invaluable part of our cultural tradition as well as an important public service. Gallery artworks are wonderful but for most people they are not accessible. Having worked on many large scale public works Gillie and Marc have seen the overwhelming contribution that public art can make to the each unique community, whilst enhancing the environment in a physical and social way. 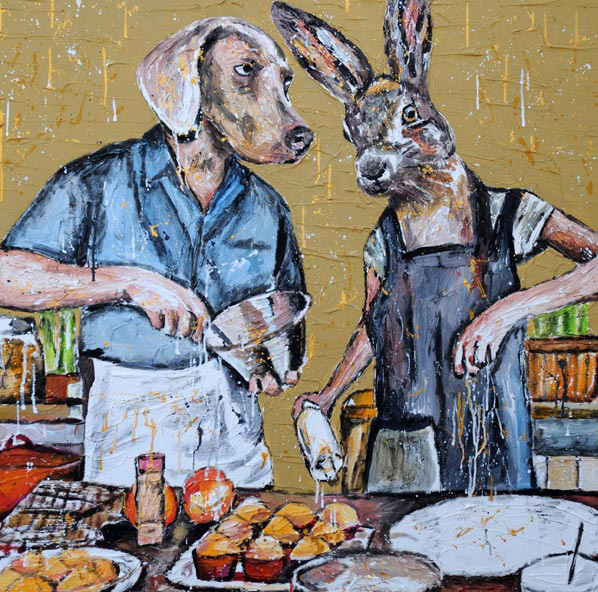 Gillie and Marc hand signed fine art print titled Cooking available from Etching House, Etching House has a full range of limited edition fine art prints, also Paintings and Sculpture works by Gillie and Marc.